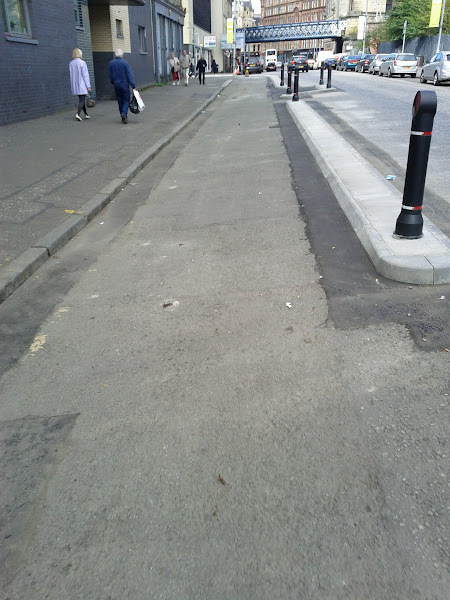 The new path starts off at Saltmarket, then joins London Rd, where it’s still under construction. It’s being built by sectioning off some of the old road surface with kerbs and concrete. The problem of course is that the roads in Glasgow at the moment are in a terrible state, especially on busier roads (like London Rd) and especially towards the sides of the roads, for some reason. Cycling down this new London Rd section on a normal town bike is not comfortable. It’s even less comfortable when you’re carrying luggage, e.g. loaded panniers as many commuters do. It’d be even more uncomfortable again on a road bike with narrow tyres (I’d stick to the main road in that case). Basically, to make use of this path you need to either cycle very slowly or else you need a heavy, full-suspension mountain bike – not exactly ideal for town! As this path is only just built, it’s possible there’s still surfacing work to be done. I can hope! 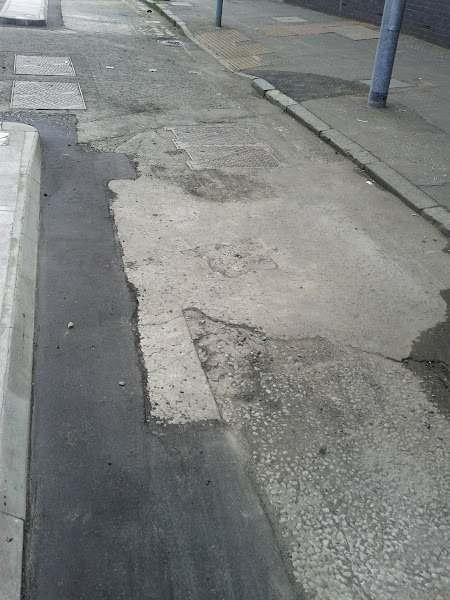 However, it’s also possible that the council do not have surfacing equipment narrow enough to fit down these paths and that, once the concrete segregation barriers are down, these paths can no longer be properly resurfaced – that the council will be limited to making ad-hoc patchwork repairs with men with buckets of hot asphalt and spades. It’s not just this path though. 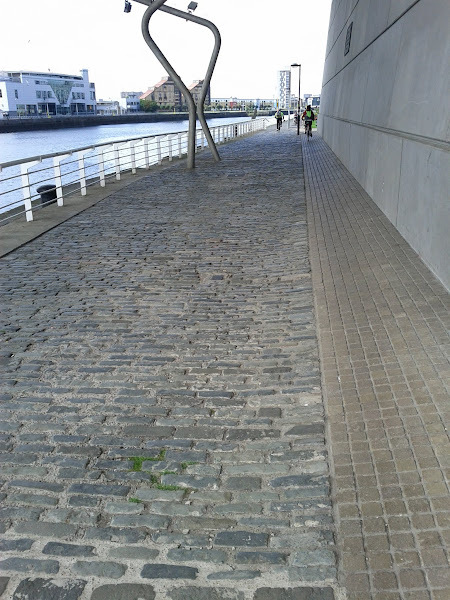 The existing NCR75 Clyde-side path is surfaced with brick cobbles in several sections! Beyond uncomfortable, it’s near unusable for all but mountain bikes. 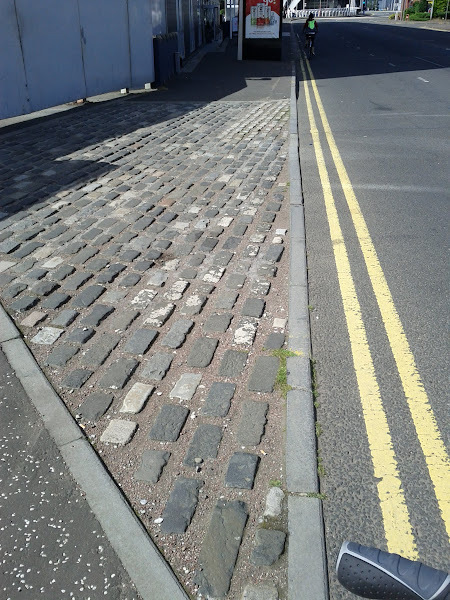 The section of NCR75 along the SECC is also cobbled, as well as being narrow and shared with pedestrians. NCR75, deep gapped brick cobble where it goes under the M8. Note the cyclist using the narrow strip of smoother brick cobble to the right. NCR75, more cobble on Lancefield Quay. Note the cyclist ahead sticking to the road. While not wishing to seem ungrateful, what is the point of building cycling paths that are bone-rattlingly, bike-to-bits-shakingly uncomfortable to use to all but those on off-road bikes? This is unlikely to help promote cycling to anyone, but already fairly dedicated cyclists. 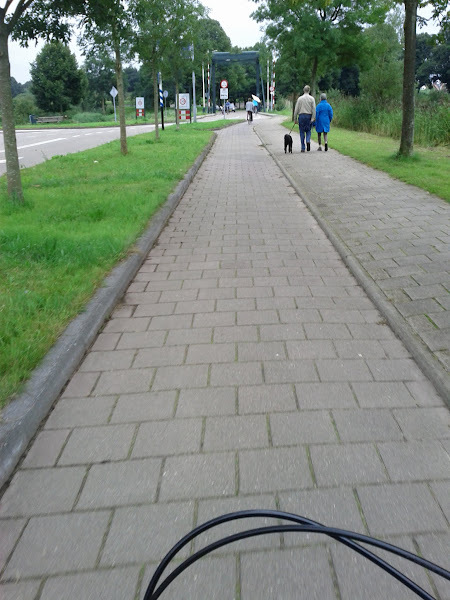 A quite old and obsolete, dutch cycle-path. Brick-tile surface, but still manages to be smooth and enjoyable to cycle on. 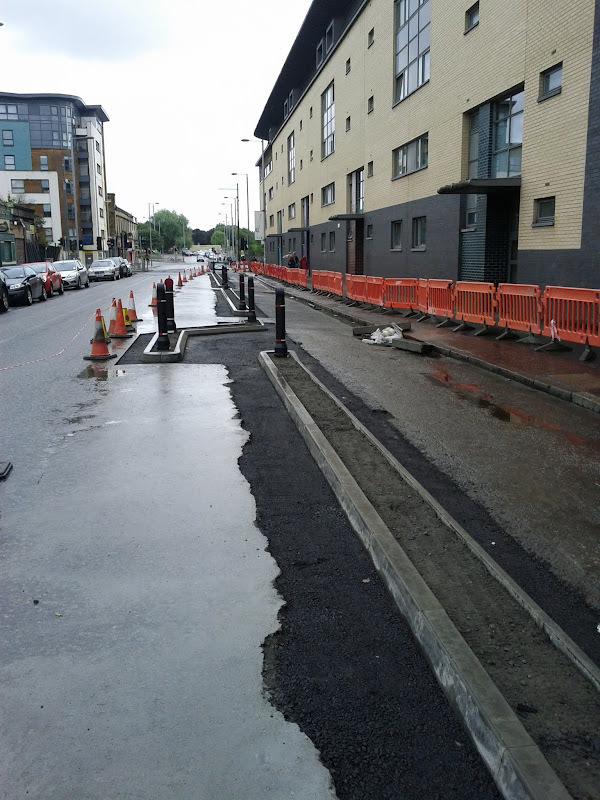 The segregated cycle path on London Road is currently under construction, the carriageway has been assessed and patched as required to deliver a suitable ride surface. The poor surface you refer to may be before this work was completed. If you have concerns regarding the road network please contact the RALF number […]. 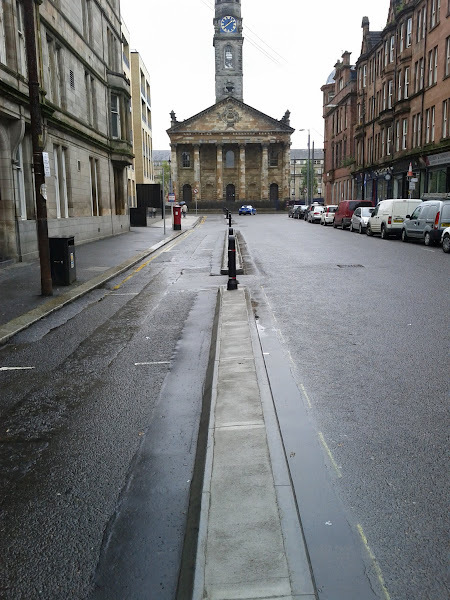 The width of the cycle route has been designed to ensure that maintenance works including road cleaning and surfacing works can still be undertaken as required within the kerbs.